Situated just off the Levante Beach near the Old Town in a small street called Passage La Gauina. Nice place to have a coffee, sandwich and read the paper. It’s Clean, It’s Fresh and the people are nice with it. Ray’s II - situated Between Avda De Madrid and Avda Mediterraneo. Super ‘proper’ fish and chips (I’m from Grimsby) nuff said. The Captains Cabin situated Avda Armada Espanola which fronts the Poniente Beach. A super bar along the main drag of the Poniente towards La Cala. I called in one evening during late February. The bar was very well supported despite the road works and improvement scheme. Ricky Dale was on and I understand he entertains here on a regular basis. If your up this way, pop in, they have loads of special offers on with food. Foca II or Two Seals on C/Lepanto oppisite Steptoes 2. Run by Nigel, Debbie and Ryan open very late in the evening. One of the very best English breakfasts around. Casa Mariano’s C/. Gerona, (Junto Hotel Pelicanos y Oca) Open 24 hours a day, Absolutely fantastic, best chips in Benidorm, try the pork baguette, never go hungry in Benidorm and so cheap. Hagars Bar - In the Old Town - Calle ‘San Roc’ No 33 Super little bar worth finding, lots of English meet here, run by two really nice guy’s Paul and Mike. Hogwarts ... 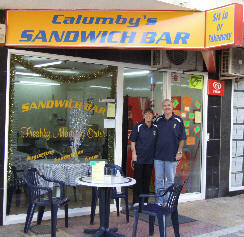 Probably one of Benidorm’s best kept secrets. Well after much deliberation I have decided to share my experience at this super restaurant. It was so good the first time I just had to go back two days later. If you want to impress someone take them to Hogwarts ..hey and it’s not going to cost you a fortune. The secrets Out. It will probably be fully booked from now and I will wish I had eaten my words!!! Michael’s Restaurant occupies an exceptionally large corner site in the ‘old town’ of Benidorm. Calle La Biga 15 is the actual address just off Calle Ruzafa. The restaurant provides a varied menu with ‘early bird’ specials and a full a La Carte menu. Large parties and Weddings are catered for.